Dangling below a thundering 234-UT Chinook helicopter on August 30th, 2017, Sierra Nevada Corporation’s Dream Chaser® was lifted 12,500 feet above Rogers Dry Lake to have its flight systems tested. It may have been a rather undignified ride for the small, re-usable spacecraft, but while the Chinook was thrashing at thin air near it’s practical flight ceiling, the Dream Chaser was nearer the bottom of its mission profile. Ultimately the lifting body craft will be launched into Low Earth Orbit on an Atlas V rocket, perform a range of tasks including ISS resupply and satellite servicing, before re-entering the atmosphere and gliding down to a thoroughly conventional landing on any reasonable airport runway. The August 30th Captive Carry Test was a systems dress rehearsal for the landing gear, radar altimeters, flush air data system, air data probes, navigation system and ‘overall systems performance’. With data from this test, Sierra Nevada’s engineers will fine tune out any issues and run a second test for final checks. Then the umbilical cord will be cut and Dream Chaser will glide somewhat steeply down to a smooth landing back at Armstrong Flight Research Centre. These free flight tests will follow on from an aerodynamics validation flight held way back in 2013 – Sierra Nevada joyfully billing that one as the first flight test of a lifting-body spacecraft in over 40 years. 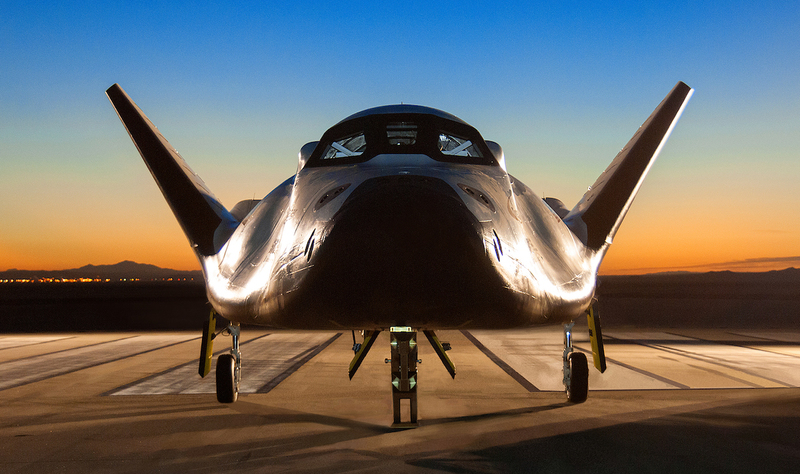 And while that claim bent the truth by more than a decade, it did hint at the fact that Dream Chaser has a past every bit as fascinating as its future. This latest lifting body design is a direct descendant of a 90’s NASA project called the HL-20 …which resulted from a Russian vehicle called BOR-4 …which was rooted in a whole family of NASA lifting bodies from the 60s and 70s …which started development in parallel with the USAFs X-20 Dyna-Soar …which traced its origins (and doesn’t all this stuff?) 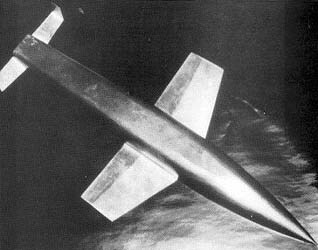 to a Nazi research project into a sub-orbital hypersonic glide bombers called Silbervogel (‘Silver Bird’). 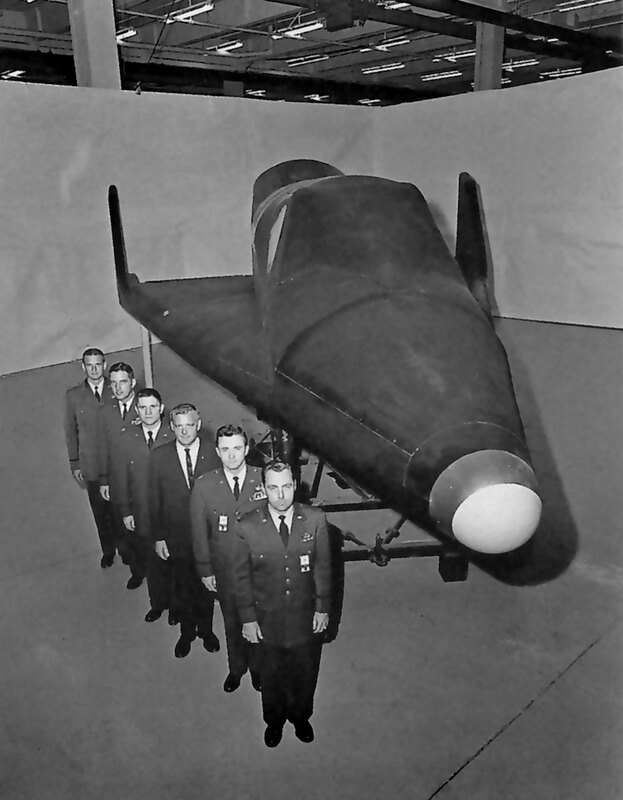 With North American’s incredible X-15 promising them valuable insights for controlling planes in space, the US Air Force developed the X-20 Dyna-Soar (a contraction of ‘Dynamic Soarer’) as a more practical application – drawing on Silbervogel principles recovered from the ruins of the Third Reich. Launched secretly in October 1957, the program attracted an elite cadre of test-pilots including Milt Thompson, Bill Dana, and Neil Armstrong. In all, eight pilots would pass through the secret program. Armstrong, of course, would progress to Gemini, Apollo and the moon; and we’ll see a lot more of Thompson and Dana in a minute. From a field of nine companies, Boeing was selected to build a Dyna-Soar fleet in June 1959, with their final designs coming ever closer to a losing proposal from the more experienced Bell company. One significant Boeing feature, though, was a modular equipment bay that allowed for more flexible internal configuration – essential if Dyna-Soar was going to keep ahead of the ever-changing list of mission and payload proposals. These days the X-20 is warmly remembered as a pathfinder that would eventually lead to Space Shuttle. 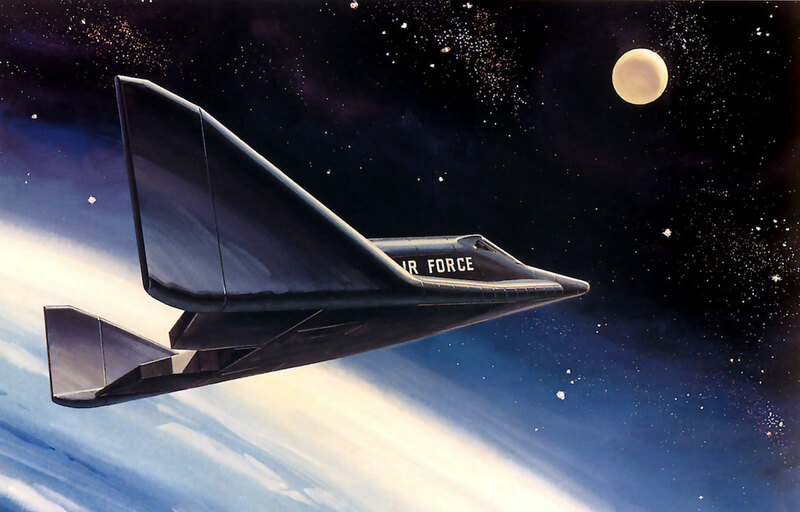 But the Air Force had its own very definite ideas for their reusable orbital vehicle – as a satellite destroyer, hypersonic bomber and reconnaissance platform. Regardless, it wasn’t to be. 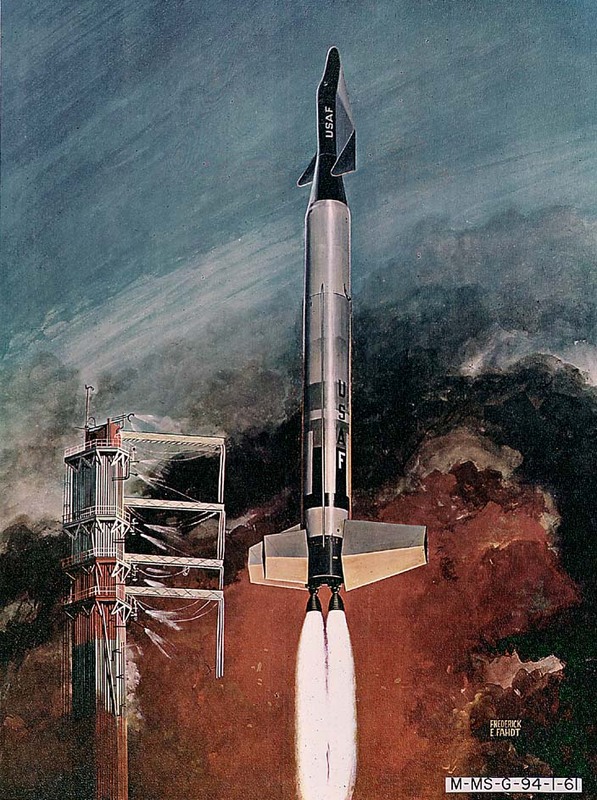 Suffering from a vacillating mission brief and uncertainty over suitable launch vehicles (the Titan IIIC was finally chosen in December 1961) Dyna-Soar’s funding was cancelled as resources went to honour Kennedy’s commitment to put a man on the moon. In his short-sighted obituary, Secretary of Defense Robert McNamara claimed the Air Force had placed too much emphasis on controlled re-entry without any real objectives for orbital flight. The reality was that the USAF was part-way to solving the second biggest challenge to space flight after getting up there – getting back. Doing both in the same vehicle has been testing engineers and taxpayers ever since. 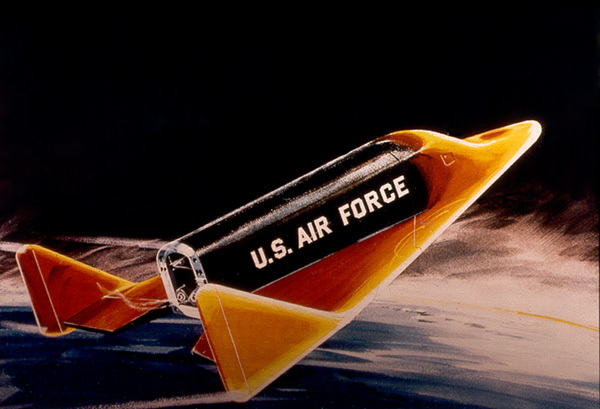 For years to come, study after study would recommend controllable, lifting body re-entry vehicles but the race into space always came down on the side of more expeditious, single-use ballistic solutions. Meanwhile, the NACA had also begun toying with the science of lifting bodies in the mid-1950s, as a flyable, reusable way to get back home from earth orbit. The basic idea sprang from the fertile minds of two NACA engineers, H. Julian “Harvey” Allen and Alfred Eggers, who presented their research in March 1958. Then, through the enthusiastic ingenuity of a young engineer from southern Idaho named R. Dale Reed, progressively more detailed ideas and design concepts were being explored at Ames Research Center by the early 1960s. Although Dyna-Soar’s wingspan of just 6.34 m and wing area of 32m2 gave it a hefty loading of 161 kg/m2 (or 33 lb/ft2) the design was still technically a small delta wing rather than a true lifting body. 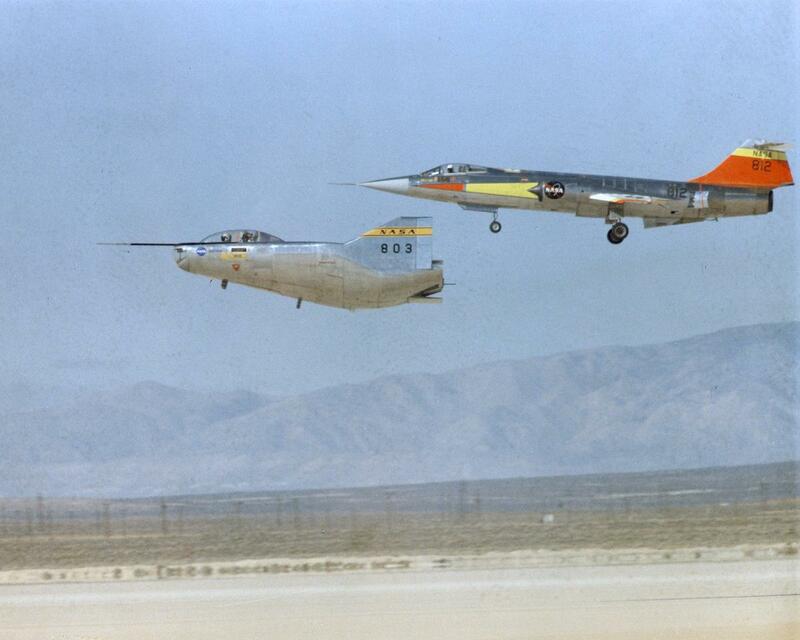 But by the time the X-20 program was cancelled in December 1963, Dale Reed and his team were testing a true lifting body of their own design at NASA’s Flight Research Center on Edwards AFB. 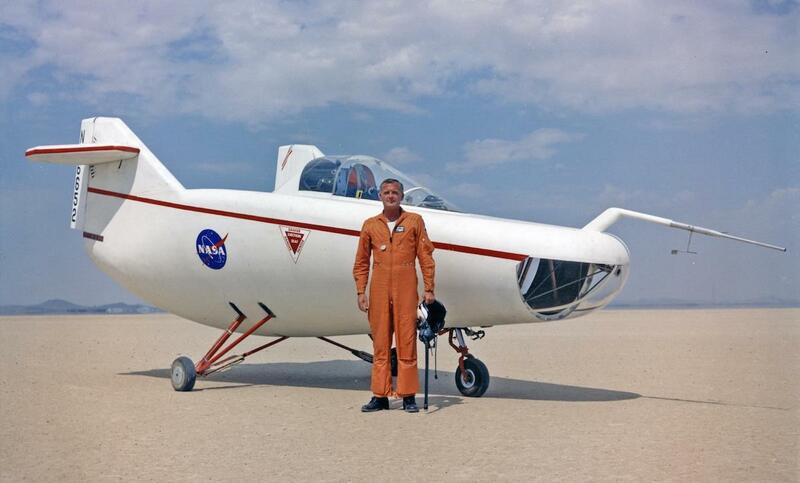 Dubbed the M2-F1, the small, rotund craft was little more than a full-sized proof of concept, based on Reed’s test models and built from steel tube and plywood for a cost of about $30,000. Indeed, the ‘M2-F1’ designation was coined from M for ‘manned’ and F for ‘flight’ variant – clearly labelling it as an extension of Reed’s small-scale test models. NASA* engineers built the frame in-house, in a corner of the callibration hangar laughingly dubbed the ‘Wright Bicycle Shop’, while wood sailplane genius William G ‘Gus’ Briegleb of nearby El Mirage crafted the mahogany ply shell. The landing gear came off a Cessna 150. And, true to the new concept’s glider heritage, it would be launched by tow – behind a seriously souped-up Pontiac Catalina. The team also built themselves a flight simulator, and used the steel frame for tow tests while they waited for the finished shell. With project pilot Milt Thompson away at the time, Bill Dana took a break from X-15 flights to try out the strange new ‘buggy’. 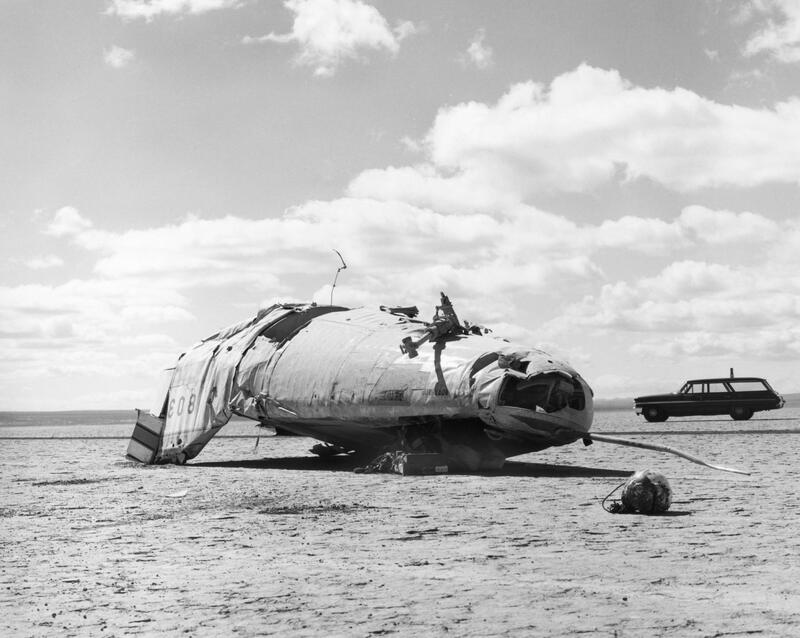 He sashayed across the dry lake on a 300-foot line, towed by a carful of engineers holding 30 mph. Unfortunately the rocket-plane pilot got a little over-confident and finished up flipping the new frame in the dirt. Happily, no harm was done except, perhaps, to Dana’s ego. Finally, the completed craft was ready and they began feeling it out with low-speed ground tows in March 1963. After steadily building up speed and ironing out kinks, in May test pilot Milt Thompson lifted off at about 90 mph, rose to 20 feet, then released the tow rope and glided back onto the lakebed. These short hops were repeated until the team had gathered basic handling data – then, on August 16th, 1963, the M2-F1 was towed to altitude by NASA’s ex-USN R4D (C-47) and released. 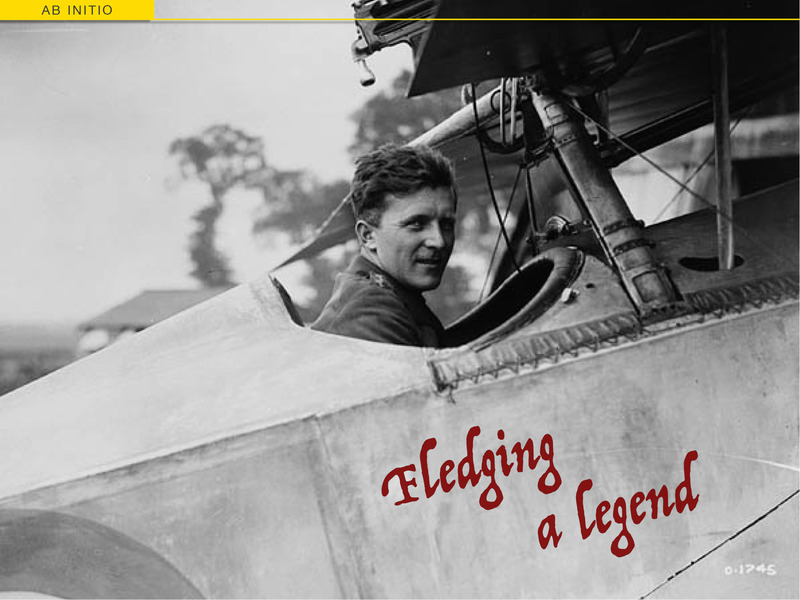 Flights continued for three years with various test pilots being invited to try out the unusual craft, including Bruce Peterson, Bill Dana and Chuck Yeager, who spot landed it on his first flight and exclaimed “She handles great!”. Of course, it wasn’t quite that simple. Along with sim time, Thompson insisted new pilots complete no fewer than 24 car tows before going aloft. They would work their way up through steering control at lower speeds, followed by nose-wheel-only rotation and, finally, short hops at 95 mph to gain familiarity with the flight controls. And even then, things could quickly go awry. When Capt. 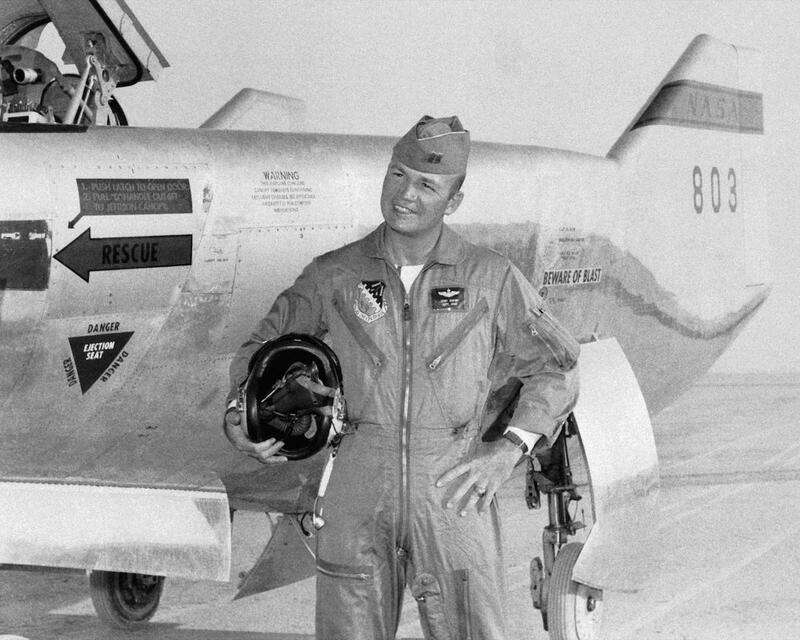 Jerry Gentry took off behind the R4D for the first time on July 16th, 1965, he overcompensated for roll deviations and began a wild pilot-induced oscillation. Flying at a scant 300 feet above the lakebed and only 100 knots, the flying bathtub rolled completely inverted as observers on the ground yelled for Gentry to eject. When the crew of the Gooney Bird lost sight of the M2-F1, they released the tow line before they went down too. Normally, the M2-F1 began its landing flare at 300 feet from a stabilised, 120 knot approach. 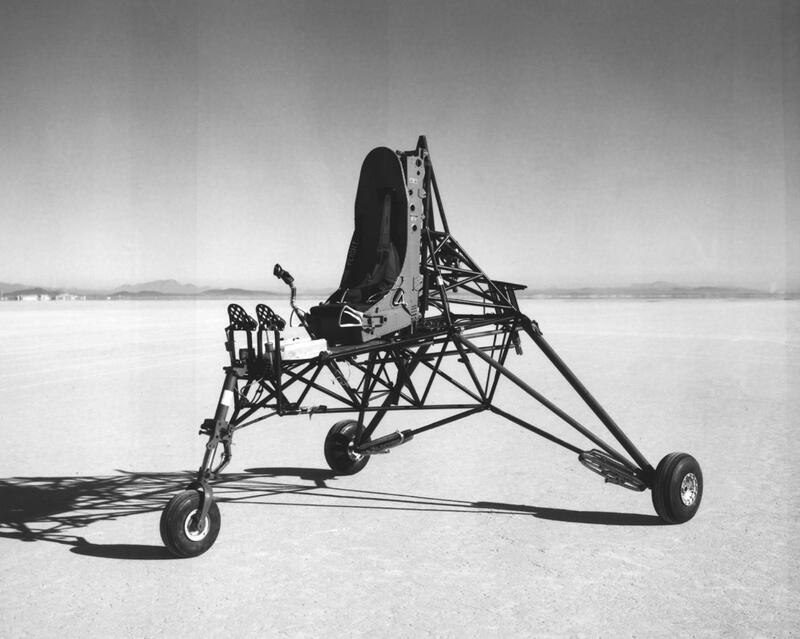 Expecting to see Gentry, their aircraft and their entire project reduced to a tangled smear on the ground, all were amazed when Gentry continued through the roll, popped the landing gear and sat the M2-F1 onto the lakebed exactly as it came back upright – all within nine seconds. In fact it all happened too quickly for the gear, which didn’t quite deploy and was damaged in the subsequent belly flop. ‘I’m the first one to roll this toad,” he exclaimed afterwards. Gentry went back onto car tows until August 16th, 1966, when he tried another aero-tow. Incredibly, the exact same thing happened again, only this time Gentry thought to fire the craft’s ‘instant L/D’ landing rockets as well, reducing the rate of descent enough to execute a perfect landing out of his unscheduled aerobatics. It was impressive, but it was also too much for the Director of Dryden Flight Research Centre, Paul Bickle, who grounded the M2-F1, effective immediately. In all, the M2-F1 had accomplished 77 aero-tow flights, plus more then 400 behind the Pontiac, producing a wealth of valuable information. 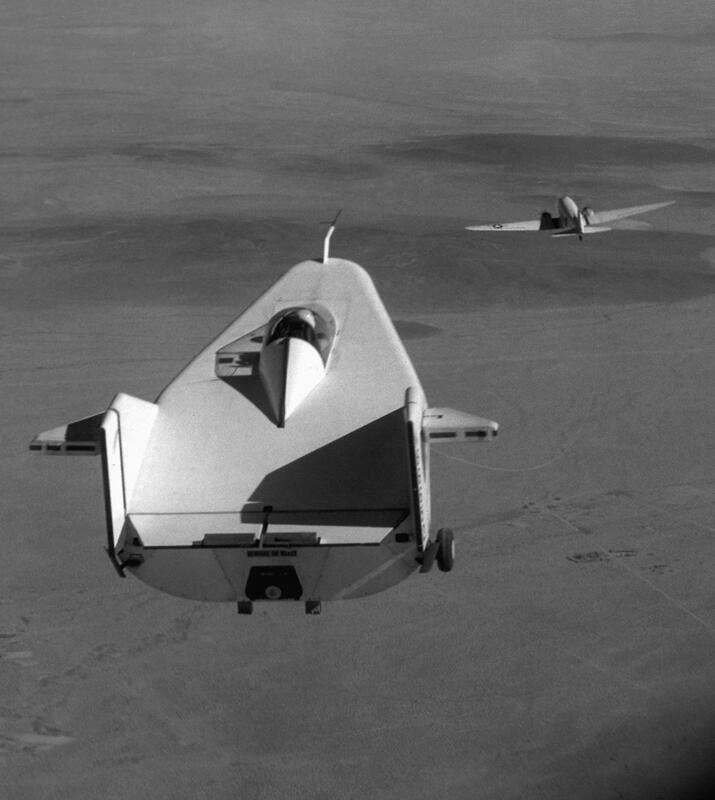 With the lifting body concept thoroughly proven, proper funding was allocated for Northrop to built a heavyweight variant dubbed the M2-F2. Dale Reed and his team were hitting the big time. 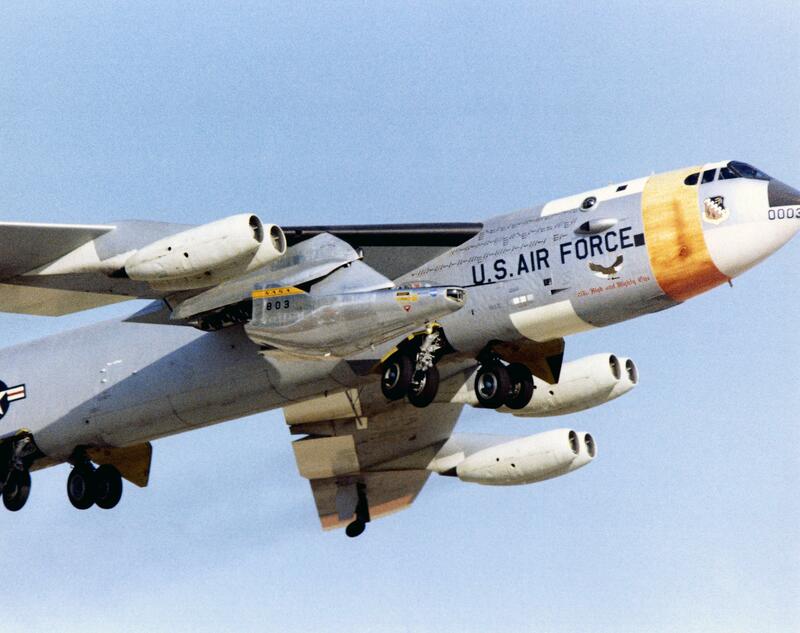 Beginning with captive flights attached to the same B-52 being used for X-15 launches, Milt Thompson took the new craft aloft on March 23rd, 1966. Then, on July 12th, he was cut loose at an altitude of 45,000 ft and glided safely back to Edwards at speeds of up to 450 mph. 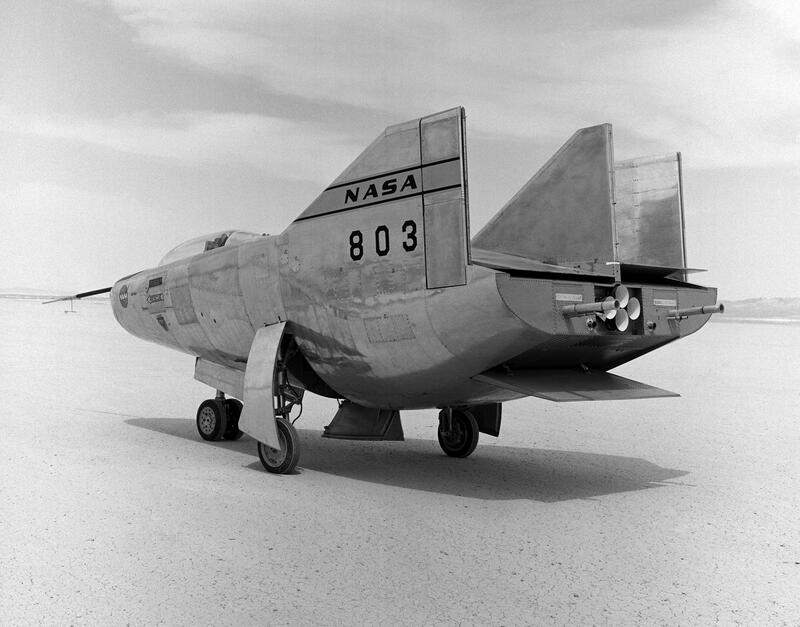 The new aircraft used the basic shape of the -F1 in aluminium, with the cockpit moved forward to make room for fuel tanks and an XLR-11 rocket motor, the same type of 8,000 lb thrust unit used for X-1 and early X-15 flights. At 3,395 kg, the -F2 wing weighed in at more than six times the -F1’s 536 kg but, more critically, its loading (for want of a better term) was almost 4½ times greater at (196 kg/m2 (43.2 lb/ft2) versus 44 kg/m2 (9 lb/ft2) for the -F1. And, as the lifting-body program gained weight literally, it also accumulated more engineers and spaceflight experts from NASA. Among these were engineers at Ames, who hadn’t been through the formative process of Reed’s core team, and who contributed a complicated system of flaps and rudder tabs to try and improve on the M2-F1’s marginal roll authority. This would prove the M2-F2’s undoing. On May 10th, 1967, at the end of the new vehicle’s 16th test flight, pilot Bruce Peterson got into a rolling oscillation as he came in to land. Then, distracted by a nearby rescue helicopter (that had doubtless noticed his trouble and moved in to be ready) he drifted away from the marked runway to raw lakebed, where height perception was far more difficult. Despite his best efforts to save the landing, Peterson slammed into the dirt with the landing gear only partially deployed. The M2-F2 tumbled over six times in a slash of flaming rocket fuel and came to rest inverted. The crash footage would become famous as the opening for 1970s TV show The Six Million Dollar Man. Peterson was rushed to hospital and survived. He didn’t get $6 million worth of bionic body parts though; he lost the vision in his right eye from a post-operative infection and had his crash re-run on TV for decades. But he still returned to flight testing. Northrop rebuilt the -F2 as the M2-F3, incorporating the third tail fin that Dale Reed had always favoured for improved control authority. It would take three years, the new aircraft finally making its first unpowered glide from 45,000 feet on June 2nd, 1970, with Bill Dana at the controls. The descent to Rogers Dry Lake, 42,700 feet below, took 3 minutes 38 seconds. Yes, that’s a ‘glide of almost 12,000 feet per minute… 118.5 knots vertical. Pretty much ‘falling with style’, as the saying goes. But falling with control, and that’s what really counts. Later flights, with the rockets lit, would top out at Mach 1.613 (924 kt or 1,712 kph) – but still last little longer than 6 minutes from drop heights of up to 71,500 feet. In all, the M2-F3 made 27 flights through until the end of 1972, and a year later was donated to the National Air & Space Museum in Washington, DC. 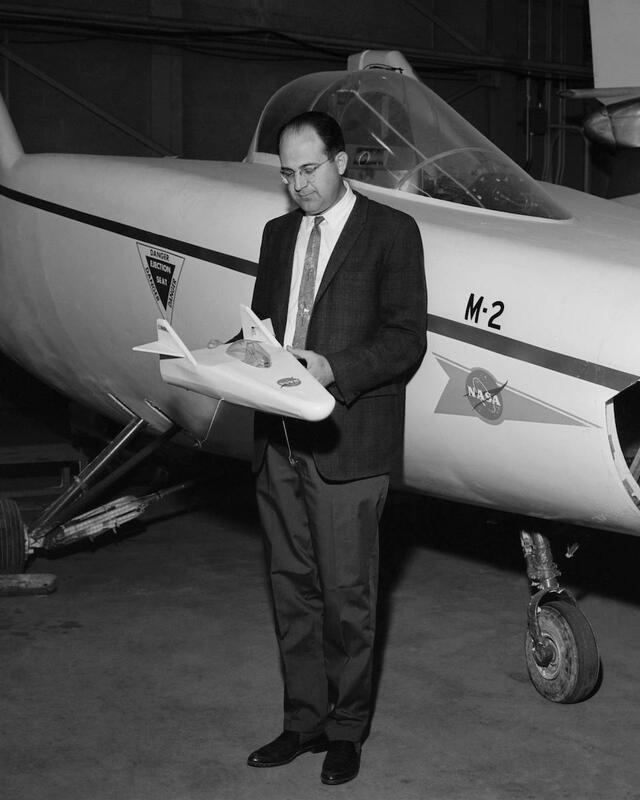 Alongside the M2-F2, NASA and Northrop were also working on a second lifting body family. Developed by NASA engineers at Langley, the design concepts explored a wide range of configurations, aerodynamic approaches and mission possibilities. Versions capable of carrying up to 12 crew in a 10 m length, and cargo carriers up to 30 m long, were all envisioned. 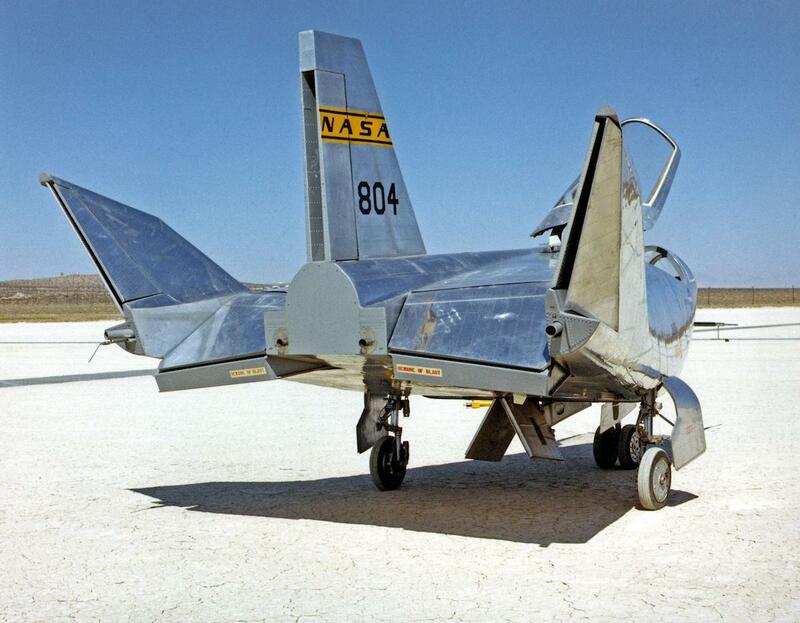 The initial test-bed, the HL-10 (HL for ‘Horizontal Lander’) would explore an inverted airfoil body shape and a more triangular planform – however long-running changes to the control surface configuration meant a proposal wasn’t issued until 1964 and a craft wasn’t delivered until July 1966. Even then the first test flight on December 22nd, an unpowered glide from 45,000 with Bruce Peterson on the stick, revealed several shortcomings with the flight control and stability augmentation systems. 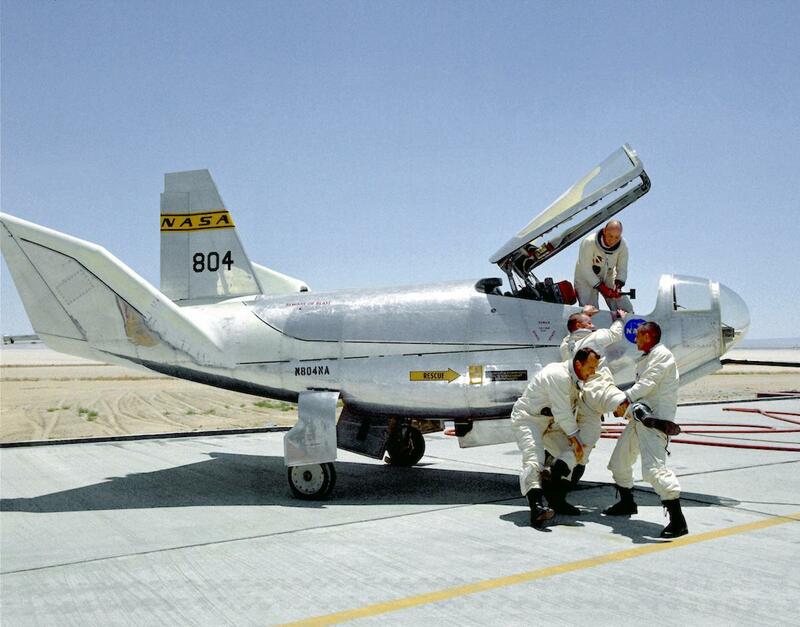 So the HL-10 stayed on the ground for another 15 months while the faults were analysed and corrections made. These included fitting new cambered leading edges to the twin tail fins, to smooth the airflow over the trailing edge control surfaces. When it finally took to the air again on March 15th, 1968, just about everyone at Edwards was watching. 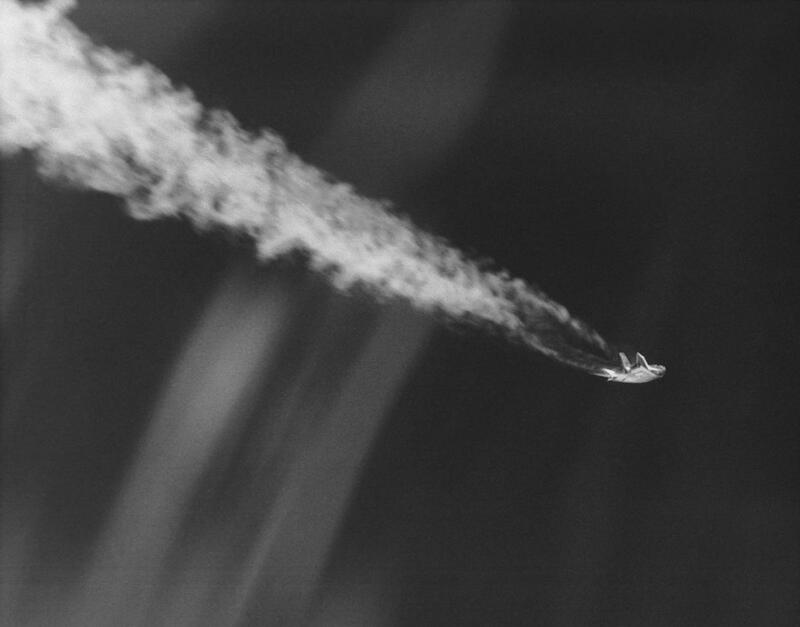 Jerry Gentry dropped out of the B-52 at 45,000 feet and made a 4 minute, 3 second glide back to earth, testing the controls and aircraft handing as he came down. The HL-10 performed flawlessly. A total of 37 flights were made in the HL-10, often several a month, with Peter Hoag making the last from 45,000 feet on July 17th, 1970. In the course of this research, Hoag would push the HL-10 out to Mach 1.861 (a shade under 2,000 kph) and Bill Dana would blast it up to 90,000 feet (27.5 km). 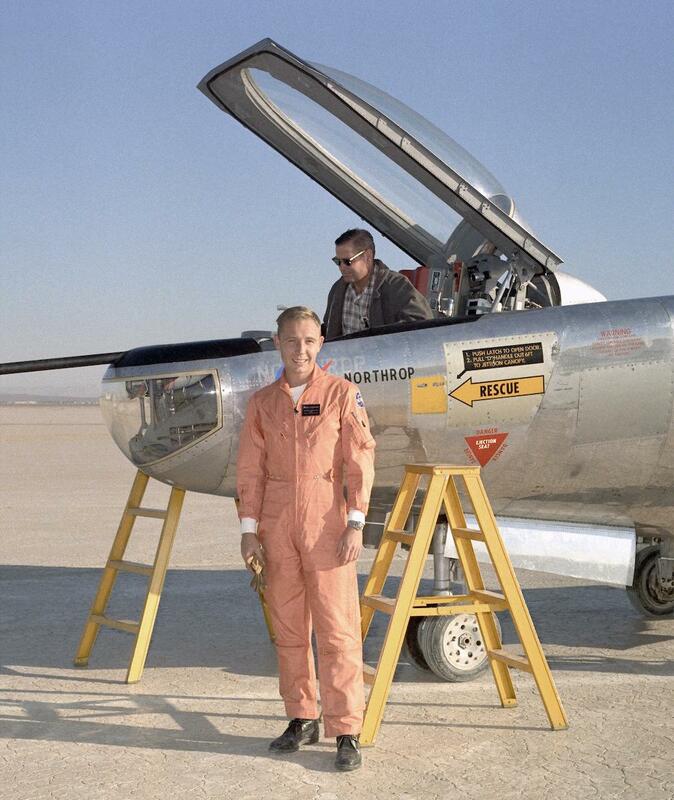 NASA’s lifting bodies were on the edge of space. Indeed, Dale Reed proposed using leftover Apollo hardware to take an enhanced HL-10 into orbit and back by the mid-1970s, at least six years before Space Shuttle Columbia’s first space flight, but the idea was panned by NASA leadership. Funny how everything old is new again, whether that’s a lifting body derived from something out of Nazi Germany or a single-use Apollo-style capsule. I love the 50’s because they were working on so many crazy X-plane ideas and many of them weren’t very expensive. Some of them were more like modern GA homebuilding than a typical big government project. Back in the days when I was more active in aerobatic competition, one of the Unlimited competitors was the chief engineer at NASA Dreyden, and she had strain gauges all over her Giles 300. Seems they were always learning new things and making improvements to it. You will probably touch on this in Part 2, but the X-37B spent more than 2,000 days in orbit… although I’m not sure what it was doing up there for that long. Yup, and lifting bodies are even ‘perennial’ rather than just ‘new again’. The fundamental concept theorised by Allen, Eggers et al and developed by R Dale Reed is obviously so solid that it just won’t go away. I think they were especially lucky in the 50s and early 60s, not just because everything seemed possible but also that exploration was so permissible. Not that the NACA and then NASA weren’t effectively managed, but once the great Cold War race to the moon had been won the bean-counters and bureaucrats really started to take a closer look at what was being done. Now, I have to admit that I glossed over the X-37 completely. In the context of this story it falls neatly between the planks of the lifting-winged Dyna-Soar and the true lifting bodies. And that isn’t helped by the USAF’s absolute secrecy as to what it’s doing up there. Systems and technology testing we think… There’s a good article about it here. And yeah, Columbia. Bugger. I’m fixing that now, thanks. I well remember the ‘lifting bodies’ as pre-cursors to the Shuttle, but I did not know all this detail. Gentry must have been quite some pilot to have retained spatial orientation & the reflexes to pull all that off in nine seconds. Great story – look forward to Part 2. In fact, Gentry didn’t just save the ship (and the program) – twice – he was also able to diagnose the problem. After the M2-F1 was grounded, he proved his problem was lack of visibility. He was shorter than the other pilots and once he left the lakebed on tow, he couldn’t see the horizon or the Gooney Bird through the nose window. With no visual reference for wings level, he had never stood a chance. When he first flew the M2-F2 on October 12th, 1966, he found he was too short to reach the gear handle and had to loosen his harness, lean forward, drop the gear, retighten his harness and complete the landing all within about 5 seconds. He was one cool hand! I feel a bit mean making you wait for parts 2 and 3 now but, trust me, it just gets more amazing. If the US and Russia had built every spacecraft they had hoped to, Star Trek would seem totally normal by now.